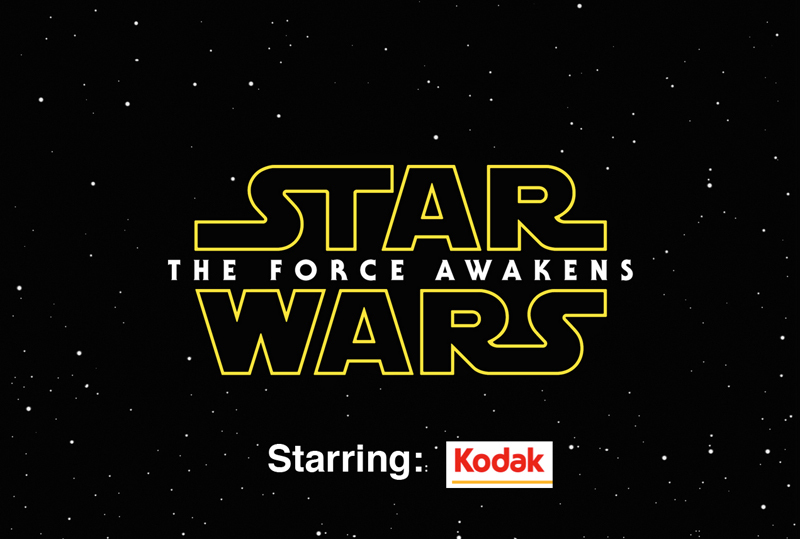 As Star Wars: the Force Awakens premiered on Monday in LA, Kodak announces anticipated profitablility in their film department for 2016. Jeff Clarke, CEO of Kodak explains the pivotal role Abrams and his support of film played in convincing Kodak to stick with film manufacture. Kodak’s success is, of course, not solely thanks to one director; many releases this year have been shot photochemically including Tarantino’s The Hateful Eight, Haynes’ Carol, Mendes’ Spectre and Spielberg’s Bridge of Spies. Many of these directors worked towards the deal between production companies and Kodak, the last manufacturer of photochemical motion picture, guaranteeing demand for stock. Clarke however, is keen to emphasize Kodak’s current solid position by stating that Kodak is no longer bound by these kind of deals. He also recognises substantial demand for Kodak film from artists who have staunchly defended their need for the medium to make work with different qualities to those in works created using digital technologies. Kodak may have further reason to offer sepcial thanks to Abrams, as it is understood that Star Wars: Episode VIII, directed this time by Rian Johnson, will also be shot on Kodak film.